From left, L.A. Council President Eric Garcetti, L.A. Mayor and Metro Board member Antonio Villaraigosa, Dodger owner Frank McCourt, County Supervisor and Metro Board member Mike Antonovich, Glendale Councilman and Metro Board President Ara Najarian and L.A. Councilman Ed Reyes. 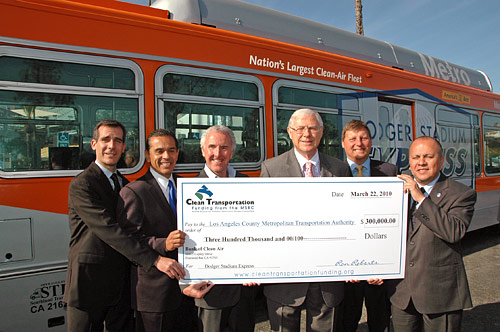 Although the announcement of bus service returning to Dodger Stadium was made a couple weeks ago, local officials held a press conference today to formally introduce the new service, paid for by a $300,000 state anti-smog grant. The basics: ticket-holders to Dodger games can take the bus for free while those without tickets can use the bus for a $1.25 fare. The bus will run between Union Station in downtown Los Angeles and the stadium — dropping and picking up passengers just beyond the left-field seats. Dodger Stadium in recent years has been mostly without public transit service, a notable departure from most other Major League baseball stadiums that are built near rail and/or bus lines. All the details are in the press release after the jump. Metro will offer Dodger Stadium Express bus service from Union Station in downtown Los Angeles to Dodger Stadium beginning April 1 with the Dodgers pre-game series and throughout the regular 2010 baseball season under a grant from the Mobile Source Air Pollution Reduction Review Committee (MSRC). The grant funding will be used to offset the cost of fares for passengers possessing a Dodgers ticket. Service will be provided starting 90 minutes prior to the beginning of the games and will end 45 minutes after the end of the game. “Dodgers fans across the county can now avoid the traffic, save gas and help improve air quality by using public transit and our new Dodger Stadium Express bus to get to the game,” said Los Angeles County Supervisor Michael Antonovich, a South Coast Air Qality Management District representative on the MSRC and a transit agency Board member. Service will be provided every 10 minutes prior to the start of the game and run approximately every 30 minutes throughout the game. Metro will deploy state-of-the-art 40-foot clean burning compressed natural gas (CNG) buses. Dodgers admission tickets will be honored as fare payment to ride the service. Those without a ticket will pay regular one way fare of $1.25. The Los Angeles Dodgers are working closely with Metro to ensure a high level of awareness for this service to Dodger Stadium and plan to continue to promote the service to fans during each game. Funding for this service is for a one-year demonstration. Metro will evaluate the success of the service and will make recommendations as to how to possibly fund this service in future years. The service will be provided by Southland Transit Inc. under contract to Metro. Patrons are encouraged to use the many transportation alternatives that serve Union Station that will connect them to the new Dodger Stadium Express. Metro operates the Metro Gold Line from East Los Angeles to Pasadena, the Metro Red/Purple subway lines from Wilshire/Western and North Hollywood to downtown and the Metro Green Line between Norwalk and El Segundo intersects with the Metro Blue Line operating between Long Beach and downtown Los Angeles. In addition Metrolink and Amtrak trains are available and Metro operates many bus lines that serve Union Station where patrons can easily transfer to the Dodger Stadium Express. For specific route and schedule information visit www.metro.net or call 1-800-C-O-M-M-U-T-E.